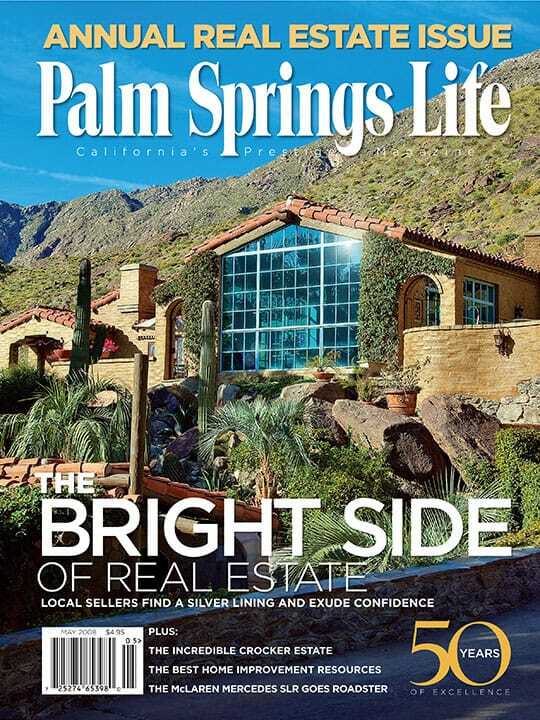 ON THE COVER – Suzanne Somers and Alan Hamel at their Palm Springs home. Photography by David Blank. We visited as many debuting restaurants as we could and selected the best. Any woman knows that style is not only what she wears, but also how she wears it. By Shellie Karabell. Photography by Fernando Escovar. Film and television professionals live here and work on Hollywood productions. Palm Springs International Film Festival rates a thumbs up from Hollywood powerhouses Peter Bart and Peter Guber. By Robert Julian. Photography by Roger Robles. A producer of infomercials and the VP of a studio raise the profile of local women working in film and television. By DeAnn Lubell. Photography by David Blank. Suzanne Somers and Alan Hamel have put their mountainside Shangri-La on the market for $35 million. By Janice Kleinschmidt and Lisa Marie Rovito. Chef Joachim Splichal in the desert, a new clubhouse at PGA West, the local Oscar party, a filmmaker’s inspirational project, and premium bottled water. Plus: Intelligencer. Lexus unveils the largest, most sophisticated ‘green vehicle’ you can buy. Contemporary artists tap into the ideals and aesthetics of a simpler time. Open-ended, exchange-traded funds offer a ‘basket’ of diversified stocks. Red and white varietals come together in shiraz-viognier blends. Johnny Boyle sang his way into local hearts. Down to Earth — Finally?